And I think when I played there -and it wasn’t just me, but a lot of guys, most of the guys in my class- but everything was a competition with us. Everything there. There was always a competition there to see who could do things the best. Q: Were there any rewards for winning these competitions? Any punishments for not doing so? Q: You guys would just go to another gym then, wouldn’t you? ZW: Oh yeah, we’d just go to another place. It didn’t matter. It was just the competition, and everyone who played there truly loved the school and loved the team, and that wouldn’t change for anything. And it’s hard to find that: where everyone on the team is on the same page and can be that happy. Q: I’m sure the pros was a different kind of experience. ZW: You know, it took me two or three years of playing pro football to come to grips with, ‘Hey, you know, the coaches really don’t care about me here.’ It was a weird feeling to come from Nebraska. And I’d get back to Nebraska and call up Coach Tenopir and say, ‘Let’s go to the recruiting banquet.’ So we go to the recruiting banquet and then we get together and go on fishing trips. There’s the money thing when you talk about pro football, but what they don’t get is when you have that bond of friendship among the players and staff. And it’s not like I never got yelled at by Coach Tenopir for messing up on a play because he’s my buddy. I mean, work’s work, but to think that you have to completely separate it and make it like, ‘Okay, this is work and there’s where you can enjoy yourself.’ But you look at the teams who win the Super Bowl and they’re the teams who were having the most fun. Q: What do you think set these teams of yours apart from others of that time? The Miami team you played, even? ZW: I think it was mostly just believing in the guy next to you and the belief in your system. 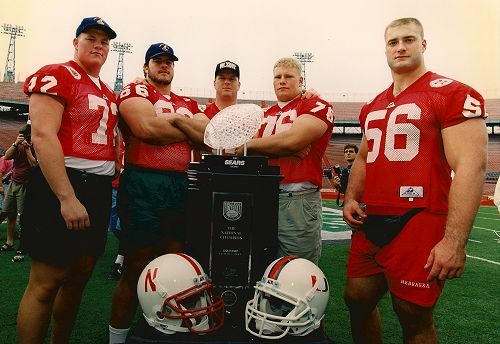 Everyone in that era before the bowl game was always, “Oh, a Nebraska team with corn-fed, big, strong guys just doesn’t have enough speed to compete with these Florida teams. The option is obsolete. You can’t win with the option anymore. It’s an old offense that doesn’t have any place.” Well, we proved that wrong because Osborne won the next couple national championships with the exact same offense. I just think that everyone believed in what they were coached. Q: Trust was a huge factor? ZW: Oh, yeah. I mean, in the pros you’ve got a guy next to you that you knew was out drinking the night before and you’re sitting next to him at the line and you’re thinking, ‘Is this guy gonna get beat and get me killed or make me look bad?,’ you know? Q: And then you’re the guy they’re spotlighting on the TV camera instead of him? ZW: Exactly. No one knows it was his guy they’re showing on the camera who made you look bad. Q: What are you the most proud of, Zach? ZW: I’m probably the most proud of the games we won that year when we didn’t have Tommie or Brook. The next year they won the national championship and they killed Florida and didn’t have a lot of really close games, but we played a season without Tommie Frazier. We had Brook Berringer, who was hurt for most of the season, and we played some games against top ten teams without either of them. Kansas State? Lawrence Philips had a cast on his hand and we had the Turmanator at quarterback. I’m not taking away anything from the Turmanator, but he’s not Tommie Frazier. Q: I’ve spoken to him and he’s said about the same, mentioning that he wasn’t nervous for that game because of the supporting cast around him, with you guys on the line and the running backs, not to mention the Blackshirts. ZW: The other team knew what we were going to do. And Stai and us, we’d go up to the defensive line and say, “We’re running it right here again. Try to stop it.” They knew exactly what we were running. Ask Coach Tenopir. I think we ran like 24 ISO’s in that game. Q: Was that the same play that sprung Cory Schlesinger in the Miami game? ZW: No, that was a trap. An inside trap. That was set up for Warren Sapp. He was so fast up the field all the time, we said, “You know what? Let’s not even block him.” He ran himself right out of the play and never even got touched. ZW: Yeah, he ran right up the field and we ran right underneath him and he didn’t even get touched. Q: Bryan Pruitt was saying that you guys were so sure of yourselves that you’d huddle up only three yards from the line of scrimmage? ZW: Oh yeah, our whole thing was to snap the ball with as much time on the time clock as we possibly could. So we just decided to call all of our plays only three yards from the line of scrimmage, and if they heard it, “So what?” It didn’t matter. I mean, there were games where we’d have three or four guys stacked right over where the ball was going, and we’d still get a few yards. Q: As an aside, as the game went on, would most defenses crumble or keep fighting the good fight? ZW: I don’t think people gave up, I just think there were times when they just physically ran out of gas. I mean, we’re running plays, averaging fifteen more plays a game than our competition. You just add that up over a game. Plus, the guys that we had hitting them were all pretty tough guys, so it was just a survival factor. I mean, you’d get into a game and they’d have their hands on their knees. You talk about that Miami game: in a timeout we’re all standing there looking at the guys and they’re all standing there with their hands on their knees trying to catch a breath. I mean, we’re down there in their weather where we supposedly couldn’t play because it was too hot. Q: And trying to snap the ball with as much time left on the clock; was it so they couldn’t get a defensive call in, so they couldn’t substitute players, tire them out, or all of the above? ZW: It keeps them from rotating personnel. Because it keeps them from running off the field when you’re hitting them, and then it also doesn’t let them make adjustments to what you’re doing, plus they don’t get any breath. Q: In other words, Coach Osborne’s halftime prophesy was all a part of his master plan to wear them down? Q: It’s great that somebody got that on film. ZW: You just look at that halftime tape, everything he said came true, “They’re going to get a penalty sometime for swinging at someone. Just don’t retaliate…” Everything he said happened. Q: What about that game stands out to you the most? ZW: You wanna know what stands out to me the most? It’s when Brook threw that interception in the end zone. It was getting a little bit late in the game and we’re a couple yards from scoring a touchdown, and we threw a pass. We hadn’t hardly thrown the ball the whole game and we decide to throw a pass… and we throw a pick. And at that point you could have gone either way: you could have been like, “Oh crap, here we go again. We’re going to give it up in the end,” but we were on the sideline and every single person on the offense was going up to the defense and saying, “Don’t worry about it. We’ve got it won. Don’t worry about it.” Not one guy was sitting there and negatively thinking about it. At that point I was, ‘No matter what happens, we’re going to win this game.’ It was crazy. You would have thought that one person would have been like, “Oh man, I can’t believe we threw a pick!” The defense was all fired up to go back out there, and they were loving it because they were killing Miami’s offensive line. To a man, every guy on the offense was saying, “Don’t worry. We’ll get this done.” We couldn’t wait to get back out on the field after that pick. And I’ve never watched the film. I have no need to watch it. The memories are so much better than the film. ZW: Yeah, and that’s the thing that really sticks out to me, was our reaction to a negative thing that happened in the game. Just the attitude. And another thing that happened -that I remember from playing at Nebraska- was the Washington game my sophomore year where we played at Washington and got beat. We got back to Lincoln at about four in the morning and there’s like 150 to 200 fans at the airport cheering for us, saying, “Hey, you guys fought hard.” You know, it’s easy to get people cheering for you when you’re winning all the time, but to have these people there cheering for us? Those are the kind of things I remember. You can’t get that somewhere else. It’s easy for people to be out there cheering when you just won the national championship, but where are the guys cheering for you when you lost? Q: Was that self-instilled? Was that instilled in you by Coaches Tenopir and/or Coach Young? ZW: You know, it’s partially that. I think Coach Tenopir and those guys really took pride in teaching us, “Hey, this is how we play here. If you don’t want to play mean and play tough, you shouldn’t be playing at Nebraska. That’s how we play.” You know, part of it was the style of football that we played. If you don’t play that way running the option, then nothing happens. So that was a part of it, but another part was that we just had too many guys who liked playing that way. We had Brenden Stai, me, Aaron Graham, all those guys. Not that we played dirty, but if we’d bend the rules as much as possible and have a great time, we were all for it. (laughs) I don’t think people enjoyed playing against us. Q: Because of the sheer physicality? The brutality? ZW: Yeah, the speed at which we played. All day with 300 pound guys going full speed, and we all knew what we were doing. And if it came down to running down a guy and chopping him at full speed, we just didn’t hesitate. Whatever you had to do to get it done. To the coaches we’d almost be saying things like, “You ran left a bunch. Why don’t you run right?” Because guys wanted the ball to be behind them, you know? Guys wanted to be the guy who made the block. ZW: I don’t know if there’s any I should say. (laughs) Hmmm, can’t talk about that one… (laughs) I think I’ll probably keep those to myself. Some probably weren’t legal, so I don’t want to get anybody in trouble. (laughs) I don’t think the statute of limitations has run out on me yet.